Following the success of their Voiture model, Nezumi is back at the vintage-inspired chronograph game with the new Loews. Clearly a sibling to the Voiture, the Loews drops a register for a “bi-compax” (in quotes because that’s not really correct in Universal Genève parlance, though accepted as a dual-register design at this point) layout, and scraps the external tachymeter. The result is a more conservative, but also more classic design. Inside, the Loews is still sporting a Seiko Mecha-Quartz movement, allowing for sweeping chrono-seconds and instant chronograph reset. The case of Loews has the same DNA as the Voiture, with a 40mm diameter, about 47mm lug-to-lug, 13mm height and twisting lugs that ooze style. It’s a nice size for the concept, wearing well and feeling modern, but not being too oversized. That said, it reads larger as the tachymeter has been moved to the dial, which in turn has an increased diameter. The Loews will come in three different finishes; polished, brushed and polished, and matte PVD. Looking at the dial you’ll find the elements you expect for the concept. The primary index consists of applied markers for the hours, around which you’ll find a printed minute/chrono-seconds index. The tachymeter then surrounds this area, creating a sort of inner/outer dial though they are on the same plane. At three and nine you’ll then find the 24-hour time and 60-minute totalizer, respectively. Like the Voiture, the Loews features a sandwich construction that puts the sub-dials on a lower plane. This adds some depth and texture to the dial, as well as a very sharp edge around the sub-dial. The Loews dial comes in three varieties: white (panda), black (reverse panda) and a mix. The white features black sub-dials and an interesting use of red and cyan in the tachymeter index. 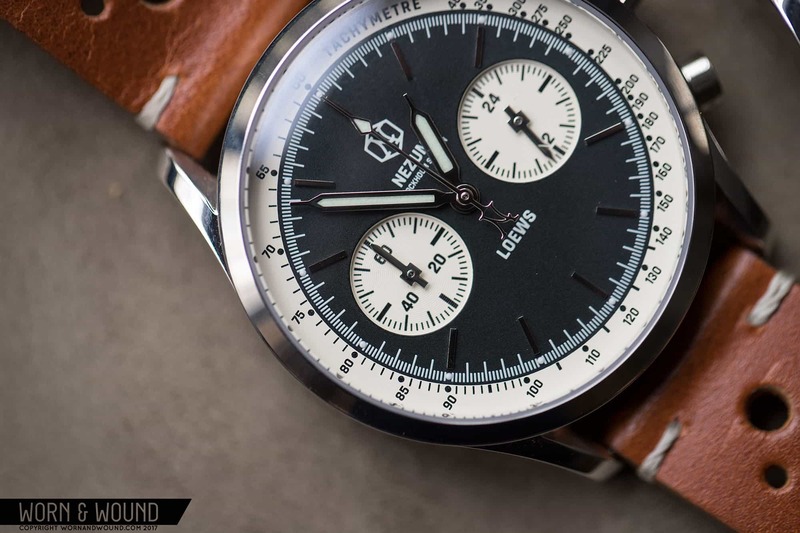 The black has white sub-dials and an interesting burnt orange for the tachymeter. The mixed is perhaps the most intriguing to my eye with its black center dial, white sub-dials and white tachymeter with black text. These elements make the dial appear a bit more compact. On the wrist, the Loews wears well. It’s a handsome watch that hits the vintage notes you’re probably looking for if you’re into the concept to begin with. It sits nicely on the wrist thanks to the moderate lug-to-lug, and it’s just comfortable to wear. The accompanying 20mm rally-style leather straps also work well with the design, and certainly adds some additional style. Overall, the Loews is definitely a successful addition to the Nezumi line. It’s interesting, as they aren’t really an evolution on the Voitures, so much as a lateral model. They are tamer and less challenging than the strong graphics of the Voitures, but as such, the more versatile option for everyday wear. So, if you’re looking for a classic vintage chronograph and either already have the Voiture or don’t want to spend the dough on one from the ’60s or ’70s, the Loews is worth considering. The Loews will be available for pre-order October 25th for about $310 (260 Euros) and then readily available in February 2018 for about $420 (355 Euros) through Nezumi Studios.